Skiing on a picture perfect fresh powder day at MT Hotham winter 2010. Why drive to the snow each day when you can wake up in the thick of it? If, like me, you get car-sick along mountain roads, then Victoria’s Mount Hotham is the ideal Aussie ski destination. After hurling my suitcase to the floor, I couldn’t wait to whip on my ski gear and embrace the snow. 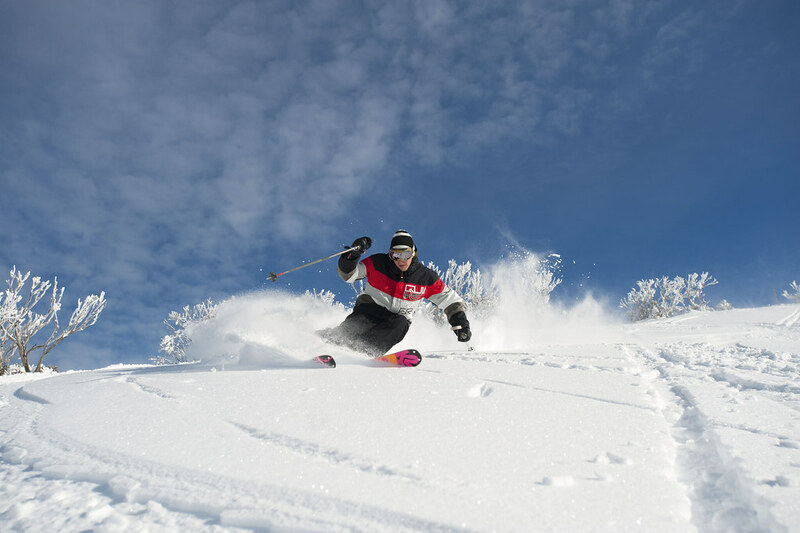 Thankfully the complex known as Hotham Central – sporting cafes, ski hire and information desk – is just a three minute walk from my apartment. “You on your own?” Aaron, a friendly young man from Guest Services at the front desk asked me as I stopped to collect a map. Turned out his job was to guide visitors around the mountains. So Aaron, his colleague Anna and I spent the next 3 hours exploring the slopes together. The next day I joined a group of ladies who’d paid up to enjoy five days of intensive lessons and a little pampering. They’d enrolled in the L’Oreal Visible Results Women’s Week, which includes four hours of skiing daily, video anaylsis, and massage and beauty lecture. The programme was devised by local instructor Heidi Pierce to help intermediate-level female skiiers reach advanced level. (This year’s course runs from July 21 to 25 but courses can be organized throughout the season. For details visit www.hotham.com.au or call Hotham Snowsports on (03) 5759 4444.). “This is my second year in a row, and I’m twice the skier I was!” one lady enthused. Nearby, the increasingly gentrified, tiny town of Dinner Plain – a 15 minute drive down the road - has some hot new eateries; from the delightful, tapas-style Cilantro (its meatballs and prawns were a knockout) to Japanese restaurant Tsubo (its chocolate tart was tantalizing). Dinner Plain also boasts an impressive new spot for massage and pampering, the Onsen Retreat And Spa. In the three years since my first Hotham visit, life off the slopes has improved in every way. Hotham’s best restaurants and beauty parlours are now as good as those in any major city. Lash out on a private lesson (two hours costs $210); it can make a huge difference. Visit www.hotham.com.au/snowsports or call (03) 5759 4430 for further details. How to get there: Hotham is located 4.5 hours drive from Melbourne and 9 hours from Sydney. Hotham has its own airport so the glitterati can charter a flight direct into the resort. Regular folk can fly to Albury (on Qantas, Rex or Virgin), board a coach and enjoy the drive through Victoria’s north eastern “gourmet” region. Where to stay: The Alberg has single rooms (from $815 for five nights off peak, including breakfast) to three bedroom apartments.